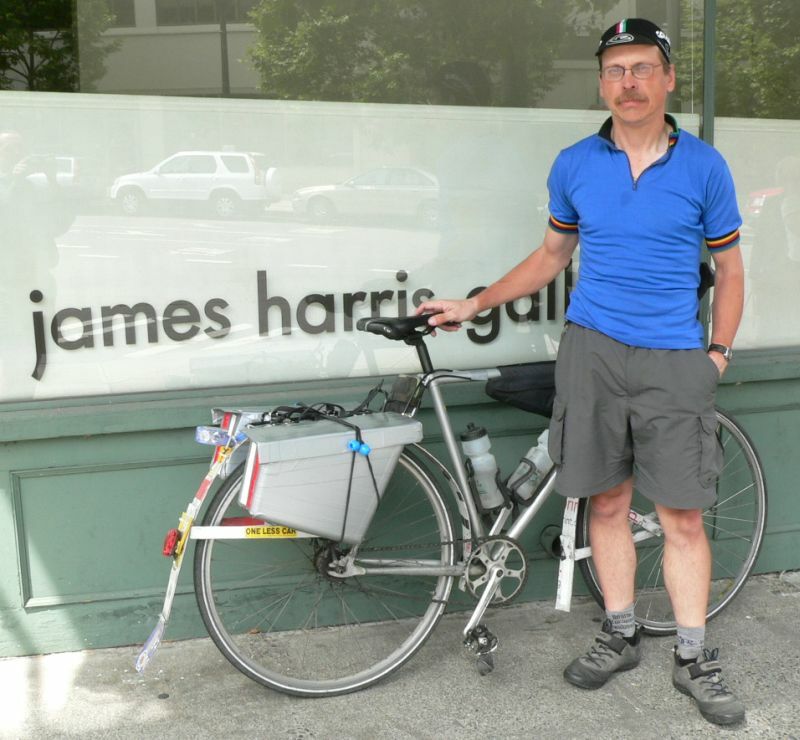 Kent Peterson gave up a comfortable tech career to pursue bike advocacy and shop work; he and his family have lived car-free for over two decades; he’s written his popular blog for over five years focusing on D.I.Y. mechanics, advocacy, and adventure; he’s an accomplished long-distance cyclist and tourist; and he once held the single speed record for the 2,000+ mile Great Divide Mountain Bike Race. In short, he’s an interesting guy. I spoke with Kent about the state of advocacy, what it is to live car-free in America, attempting to recapture his Tour Divide record, and beating Ira Ryan in an underground race from San Francisco to Portland. A lot of folks love bikes, but few would probably leave their comfortable white-collar careers to wrench. How and why did you go from software techie to advocate to mechanic? I guess what it comes down to is, I value time more than money. There are a lot of people who work all their lives towards someday. “Someday I’ll do this” or “when I retire I’ll do that.” Throughout my life I’ve been too impatient to wait so I’m going to figure out how I can do fun stuff on less. Back when I rode Paris-Brest-Paris I was still working the software thing and it was kind of cool because I could say “oh its gonna cost $1000 to fly to France, I have that.” But, I’ve actually been able to do a lot more adventures since I scaled way down. The first time I rode the Great Divide race, people asked me “why’d you do it on a single speed?” There were a couple of reasons, one was that I wanted to do it very simply. But another is that racing on a single speed is a much more interesting story. I thought, maybe if I do it on a single speed I can get Dirt Rag interested (and I did). The lack of money makes you more creative. That said, I’m always skirting the edge of being completely broke. You spent years advocating for bikes at the Bicycle Alliance of Washington and Bike Works. What’s it going to take for bikes to gain acceptance as viable transportation in the U.S.? I’ve really enjoyed the times I’ve worked in advocacy. But, I learned that a lot of the effort you put in is not so much fighting against the enemy. You spend a lot more energy discussing technique and focus. Witness what’s happening at Cascade [Bicycle Club] right now. A lot of the work that needs to be done is not glamorous at all. I was amazed, a lot of the stuff we did at the Bike Alliance is stuff people never see. Practically every year, someone will see a parent riding with their kid in a bike trailer. Then some well-meaning, but misguided person will say “my god that’s dangerous. That should be against the law. ” Almost every year, a thing like that will get introduced into legislation somewhere. Organizations like the Bike Alliance make sure those things don’t become law and that’s the stuff that nobody ever sees, really. To answer your question, I’ve found working in bike shops I probably get to do more grass roots advocacy and have a greater effect. What it’ll take is for more of us as individuals to live the life we believe we should. And then, the organizations will grow out of that. One day, John Duggan, a cycling attorney in Seattle, walked in and I said “John, I want money to give lights to people.” He gave us an initial $500, we got some people to match, and were able to give out lights. That was something that actually made a difference. Even as an individual I do this sometimes if I see people riding around without lights. I carry spare lights and stuff. If you’re riding around on a $5000 Colnago I’m not going to give you lights. But if I see somebody who’s scrounged their bike out of a dumpster and I’ve got a light and they don’t, I see what I can do. That’s the kind of stuff we all can do. You and your family have lived car-free for a long time. Is it difficult or limiting ever? What was it like raising a family car-free in a country that wasn’t built for living without a car? It’s interesting. It is limiting in a way, but limits are not bad things. Limits are how all art gets created. People write sonnets, they write haiku. They write within a form. The hardest part of going car free is reshaping the life you’ve built around a car. It’s easy to say it’s hard to go free in such and such a country, but it’s much more about breaking your own habits. When Christine and I made the decision to go car-free it wasn’t a huge thing, it was more an economic decision. Again, we view economy as time and fun. Bottom line, I just didn’t like driving. If you look at car commercials it’s always professional driver, closed course, burning through the redwoods. Man, if driving were like that everyone would love it. But we have this thing in our society where we build up stuff and make it so it’s really miserable, then we go well, what can we do? We’ve made driving that way for a lot of people. But, bicycling I always really like. My wife, she’s car free, but she does not characterize herself as a cyclist. She’s much more of a pedestrian and mass transit person. It’s a lot easier now. There are a lot of tools out there to help people go car free, like Walk Score. Where Christine and I live right now, we are a block away from the market. When we moved there we plotted out where the schools are, where the hills are, all those things. We tend to be the least in your face car-free people. There are people that know Christine and have maybe figured out that she doesn’t drive anywhere, but they assume that “oh your husband has a car.” And they see me and assume, “oh your wife has a car”. Then they see us together and start asking us questions and you see the light bulb come on. That’s way more effective advocacy than saying “I’ve got an Xtracycle and I just got 150 pounds of dog food because I could.” Nothing against the Xtracycle folks, but if you live in a second-floor walk up you’re not going to have an Xtracycle. Your attempt to recapture the singe-speed record at the Great Divide Race last summer didn’t quite pan out. What happened out there? Any plans to make another go at it? One of things I set out to do was take more pictures this year, but by golly it takes time to take pictures. So there was that. Also, I’m a really good camper. I’m phenomenally good at camping, and I thought of that as a really good asset because I could camp anywhere and didn’t have to push on to towns each night. It would start getting dark and I’d just set up camp. But, the thing is, my competitors were viewing this more like a race and they’re not as good of campers, so they’d push on to get to the next town. They’d hole up in a motel and feel guilty about it. I’d be camping by some old mine and it’d be picturesque. I’d get up in the morning feeling noble. Then I’d make it to that same town and have a big breakfast and well, all those things kind of add up. I was still chugging along at a hundred miles a day, but the guys who are really good at racing are excellent campers and they’re incredibly disciplined. Guys like [six-time Divide winner] Matthew Lee. By the time I ended up bailing out of the race, Matthew was a state ahead of me! Yeah, I also hit a barbed-wire fence, cracked a rib, and busted a knuckle in my hand, but I kind of minimized those things because I was just amazed that I was alive. But, the night before I wound up having the mechanical problem, I’d gotten the word that Dave Blumenthal had died. And that really gets you questioning the whole big picture thing. When my freehub blew I could have gotten to civilization, had Seattle Bike Supply ship me a wheel, and only lost a few days. But, pretty much everyone slower than me had already dropped out, one of the things I’d really wanted to do was see the Canadian section and I’d already done that. So, I was sitting there and I decided, yeah, I’m done. Part of me says I’m OK with that. Part of me says jeeze, I can’t believe I did that. The best part of it was my wife–who was sitting back home being mission control–when I got back she said, “I want to go to Montana. I want to see it.” I’ve learned I’m way too good a tourer to be a racer. I’m going to go back and Christine and I are going to tour. Probably not the whole thing, but to me that’s just huge. You once beat Ira Ryan and a bunch of tough-guy messengers in an underground race from San Francisco to Portland. First, that’s awesome. Second, how’d it feel to go in as the unassuming, middle-aged guy and crush the competition? For one, I didn’t feel like I was crushing the competition at all. I think that still is my favorite event because it was so underground. I heard about it from my friend Tarik. He sent me an email with the subject line “A Really Dumb Race, Perfect For You.” I thought, holy cow this looks really good. Show up in San Francisco, choose your own adventure. There was another guy Cory from Philadelphia. Big dude and he had one of those huge Kryptonite Fahgettaboudit locks chained around his waist as a belt. He had a giant 15-inch wrench crammed in his pack. But by the end of the race, both Cory and Ira had jettisoned a ton of stuff. I still kind of count that as a fluke. So, what’s the next big adventure? Everything’s a big adventure. It really doesn’t stop. The next adventure is going to involve Montana. Christine and I are working out the logistics of that trip. There’s still that whole making a living thing to consider, and now it’s the slow time in bike shops. Anyways, there’s going to be adventure. I don’t know what it is, but I know that you kind of keep going. I’m going to try and keep having fun and also try to keep doing interesting things. 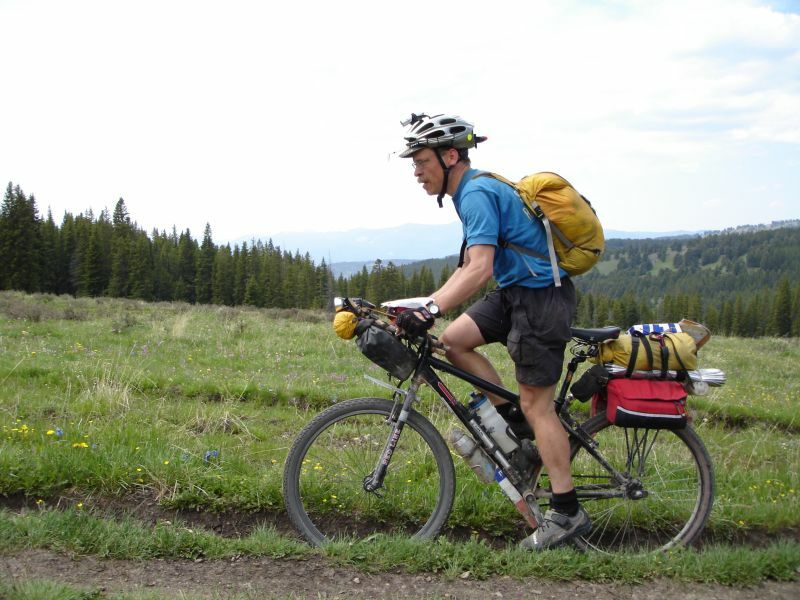 This entry was posted in Advocacy, Interviews, Mountain Biking and tagged bicycle alliance, bike advocacy, bike works, great divide mountain bike race, kent peterson, living car free. Bookmark the permalink. If you would ever like to come and visit us we will be glad to take some time and show you what we do and how we helped cyclists. You have my e-mail so feel free to pay a visit anytime. We will have some goodies for you on the house. Hi, I’m interested to see such a great blog dedicated to creativity and cycling enthusiasts cycling time spending. Earlier (several years ago), I’m also a big interest and benefit involved cycling tourism in the surrounding areas – in the Crimea, where I was prozhivayu.Rad to meet you! All the best and good luck! Gotta love the web (of life), 22+ years since I left Seattle and then I tripped over your blog. Well done! Delighted to know that you are still pedaling. I recall following your emails and blog when you lived in Minnesota. You are an inspiration to older but serious cyclists. Keep going strong. Hey Kent, I’m now living in The Dalles, Oregon & believe it or not I’m officially retired, which means I get a little bit of money & a whole lotta time just the opposite of the last 48 years!!! So I see your into scooting, any thoughts about doing S2S on the scoot? It comes to me that Redmond Cycling has dropped S2S & CannonBall. Which seems par for the course as its been 10 years since my DNF for S2S & I’VE been planning to reclaim avenge that & ride into Spokane amid triumphant cheering (in my own mind)!!! But it appears currently that’s not to be! I’ve put out pleas to Joe Matthews & thru him, to Duane Wright! Any support & attention you could put on would be greatly appreciated. I have 6 folks who say they are committed to riding so realistically that means 3 including me. ON another thought thread, are you going to Bike swap, probably not the place for scoot parts! IF so I’ll be at booth 63. Keep the Rubber Side Down & the Sunnier Side UP! We’ve made a great short film about the tour de france we think you’d love. Appreciate any sharing you could do.